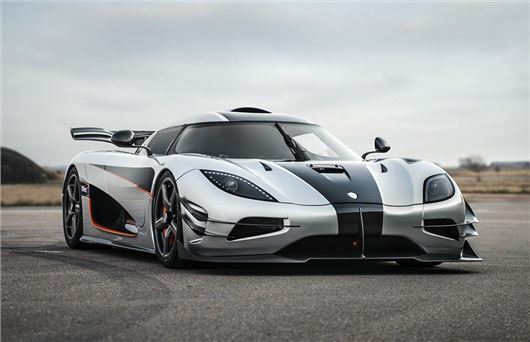 The Koenigsegg Agera One:1 - the model dubbed the first 'megacar' - will be shown for the first time in the UK at this year's Goodwood Festival of Speed which takes place in late June. The Agera One:1 makes even the rest of the Koenigsegg range look ordinary with 1340PS from its upgraded 5.0-litre V8 engine. Designed as a track-based car it will accelerate from 0-62mph in 2.8 seconds and manage 0-185mph in just 12 seconds. Top speed? A mere 273mph, although that is 'theoretical' having been measured from simulated testing. At Goodwood the Koenigsegg will be displayed on the Michelin stand and will take part in the Michelin Supercar Run. It will also be the first time two One:1 models have appeared together anywhere in the world, such is its exclusivity. Thanks to all that power and a lightweight design, the One:1 has an astonishing power to weight ratio of 1:1 and is the first production car ever to produce a Megawatt of power. It also has a Le Mans-inspired active wing that produces the equivalent of 600kg of downforce. It also has a 3G and GPS controlled Predictive Active Chassis. As you'd expect of a car like this, it uses bespoke tyres in the form of Pilot Sport Cup 2 tyres. Pilot Sport Cup 2 is a tyre that is homologated for the road but designed for top end circuit performance based on patented endurance competition technologies. Just six examples of the Agera One:1 will be produced and all have been pre-sold. Two are going to British owners with the other four destined for China.